You can't tell from the picture, but the crack goes all the way to the bottom and to the top! Three windows now! 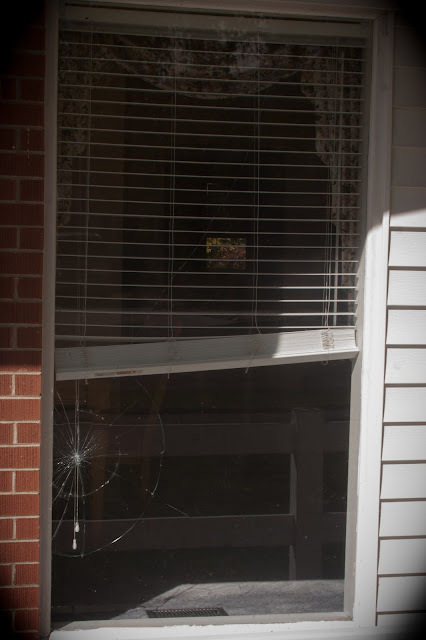 My oldest son has broken THREE windows! The first one happened on Max’s third birthday. Turner at the time was four. He was outside patiently waiting for my parents to arrive for the party. I don‘t remember why my parents were in town, probably for conference, but they were bringing my grandma over for the celebration. He got bored and started throwing rocks. He ended up throwing a rock at our large kitchen window. The spider web started small but quickly spread. The fact that my mother and grandmother were here was probably the only thing that saved his life that day. My husband was upset but my mom and grandma reminded him that he is only a little boy, and accidents happen. It would be almost two years until that window could get replaced. At one point the cracks got covered with blue painters tape. We were officially the most red neck house in the neighborhood! Not long after the first incident, the same little boy was throwing rocks again—this time at the front door. Again he broke the window on the door. It still is cracked to this day. Our beautiful front door crack. My little guy grew and we hoped he had learned his lesson. When we finally replaced the kitchen window, we had all of the windows replaced, and felt it a good investment to buy windows with a lifetime guarantee. No matter what happens, even if my kids break the window, it will be replaced at no charge. We felt that we were safe! That is until today. I was making lunch when Turner ran into the house and started heading downstairs. I should have clued into the fact that something was wrong because he never goes downstairs by himself. My main concern though was that he had left the front door open for flies and two-year-olds to roam freely in and out of my house. I asked him to go get his brother and sister, bring them inside, and shut the door. He got really flustered and muttered something under his breath. I could have sworn it was something to the effect of “I just broke a window at the neighbor’s house.” I said a quick prayer that I had heard him wrong and asked him to repeat himself. Sure enough he confirmed that I had understood his mumbling. He started screaming and ranting. I could tell that my little guy who struggles with his temper was losing it. I attempted to calm him down and explain that we needed to apologize and make it right. He was too scared which came out in the form of anger. During my attempts to calm him down, there was a knock on my kitchen door. There is only one person that uses that door, and it is my neighbor whom just had her window broken. The part of the neighborhood that I live in is mostly older widows and widowers. These particular neighbors are still both alive but retired, older, and struggle with some health problems. They have been the best neighbors, always so thankful for taking their garbage out or bringing in the empty cans. I feel bad because we hardly qualify for any blessings since they are always giving us gift cards, letting us use their snow blower, giving my kids cookies and treats. They are such a joy to live by. Anyway—I guess what happened is that her great-grandson was over and he had a tee for t-ball. 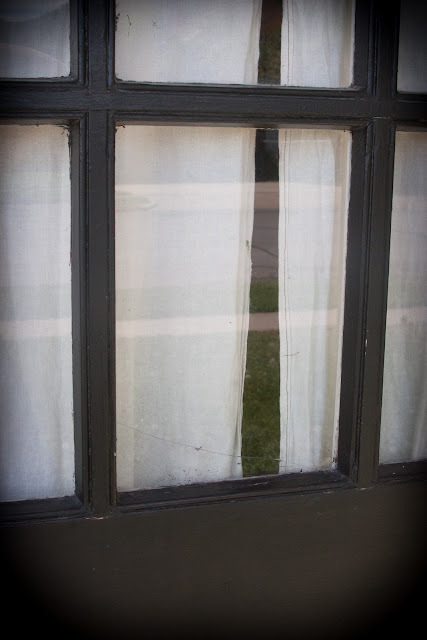 Her great-grandson had shown Turner how to use it and told him to hit the ball softly (Turner has never hit a baseball before in his life) he gave it a good smack and it went right into the ground to ceiling, huge-widow beside the front door. As I answered the door and apologized that we hadn’t come back over yet and she simply said, I want to talk to Turner. He was standing behind me, visibly upset. As soon as she saw him she said, “Oh Turner, I’m not mad at you. It was an accident, it is okay. Mr. Miller* isn’t mad at you either, we understand, it is okay.” I saw the look of terror slowly melt from his face. I reached my arm out and drew him under to give him the assurance that everything would be fine. Then he had the courage to apologize for his mistake. I was so touched that our sweet neighbor would go out of her way to extend an arm of forgiveness before an apology was even issued. She didn’t wait to hear “I’m sorry,” she freely forgave. Her offering of forgiveness gave a little boy the courage to apologize and attempt to make things right. I of course offered to pay for the window. Later Turner was frustrated that I had offered to pay for the window, assuming that he would have to pay for the whole window himself. I explained that Dad and I would talk about it and decide what we were going to do but that it was an expensive window and there is no way that he would be able to pay for it by himself. I then had a chance to explain grace. Most of all I am thankful for my Savior whom offers me grace every day. I can’t possibly right all of my wrongs, I can’t fix everything. I don’t have enough patience, money, talents, skills, or resources to do the things I need to do. I don’t have enough hours in the day, yet He offers me His grace. He promises that it is sufficient for all if we will but ask. I hope I can be like my sweet dear neighbor and offer forgiveness, even before the apology. What a great world we would live in if were all a little bit kinder, forgiving, and remembered that the Lord offers us, and those whom offend us, His grace. *names have been changed for internet privacy. What an awesome neighbor! I hope it's something that sticks with Turner his whole life. That is a wonderful lesson. beautiful! thanks for this great lesson! Beautiful! Thanks for this lesson! Truly a beautiful story. Definitely something we all need to hear at some point in our lives and over again. Thanks for sharing.